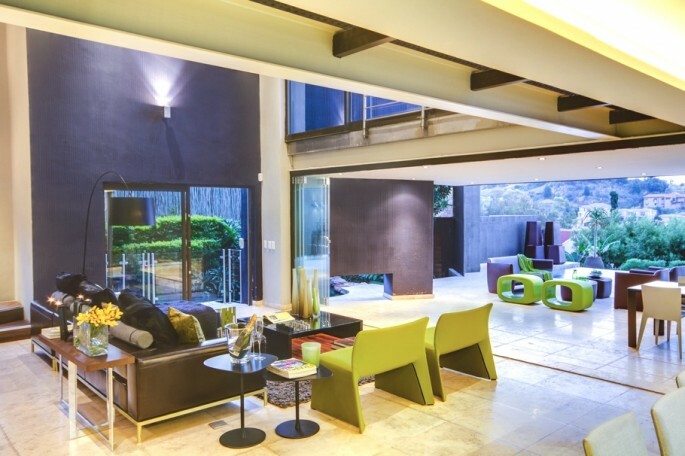 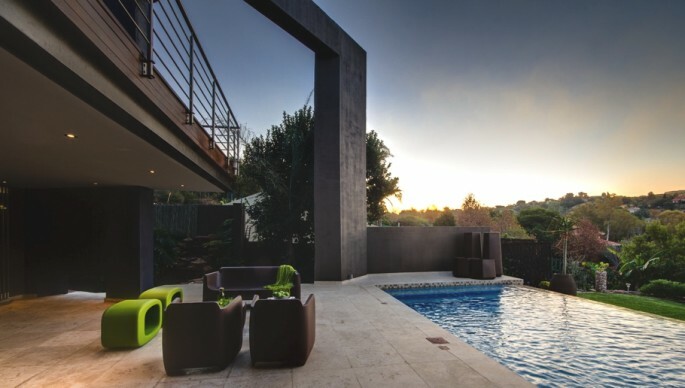 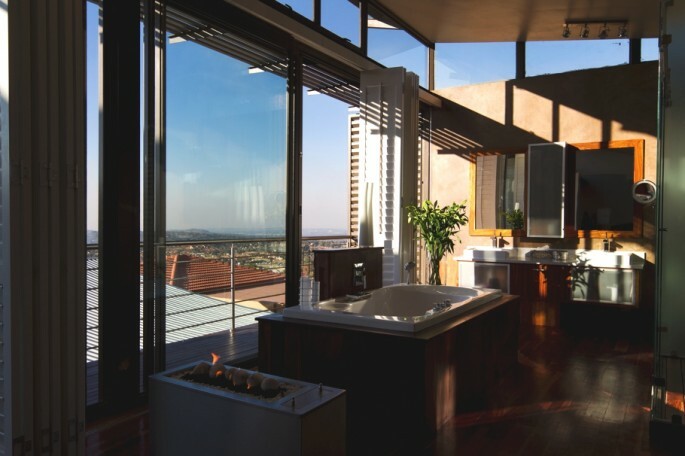 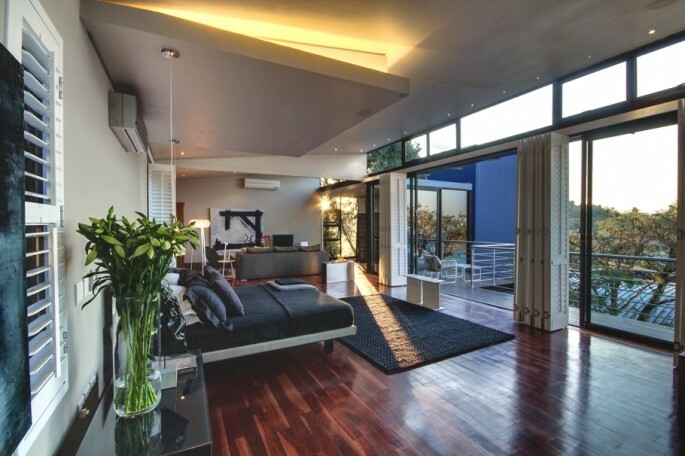 Johannesburg-based design studio Nico van der Meulen Architects have completed the ‘House The’ project. 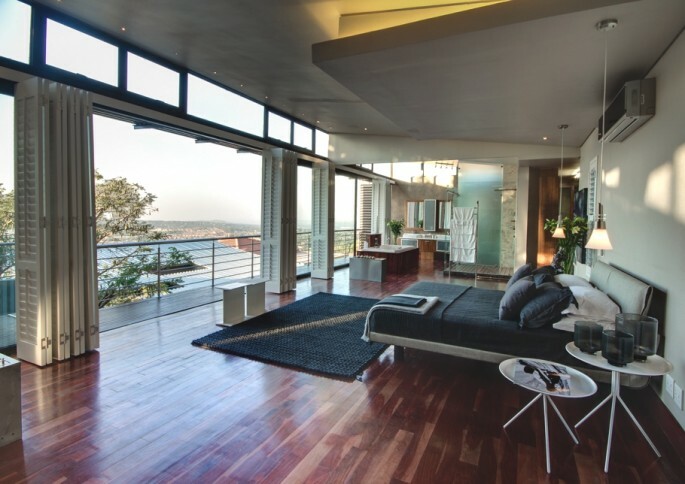 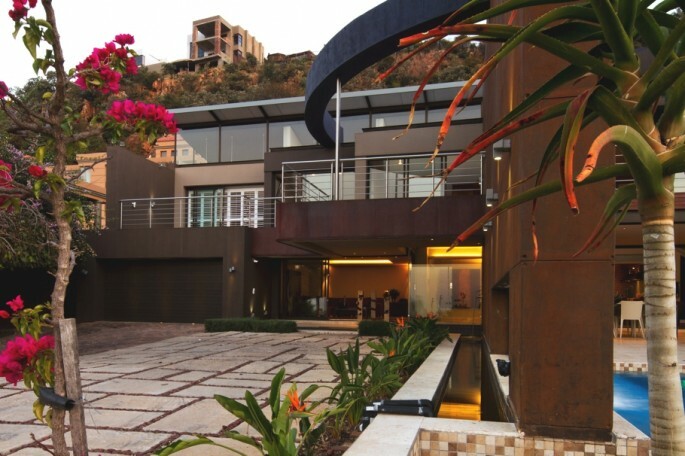 Built in 2012, the contemporary home can be found in South Africa. 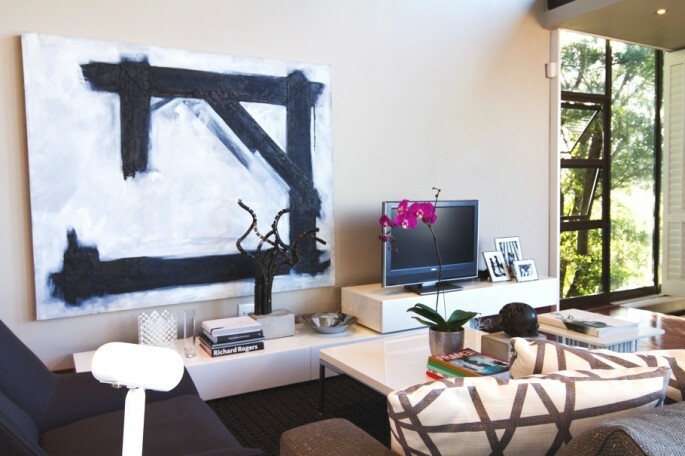 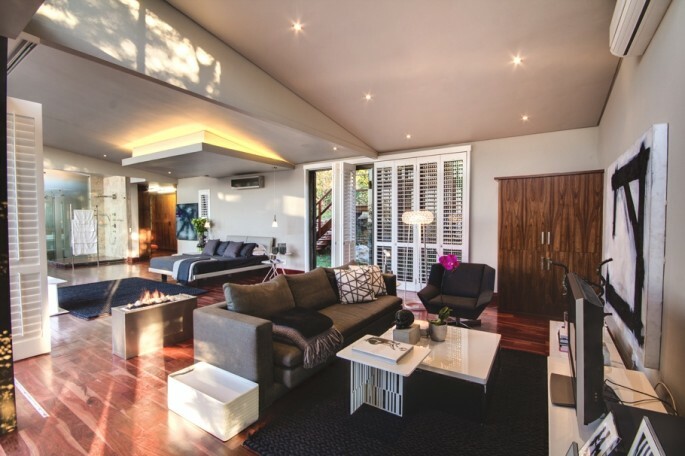 Following the trend of making alterations to and revamping existing houses, the owners of this contemporary South African home enlisted the expertise of Nico van der Meulen Architects for a modern upgrade. 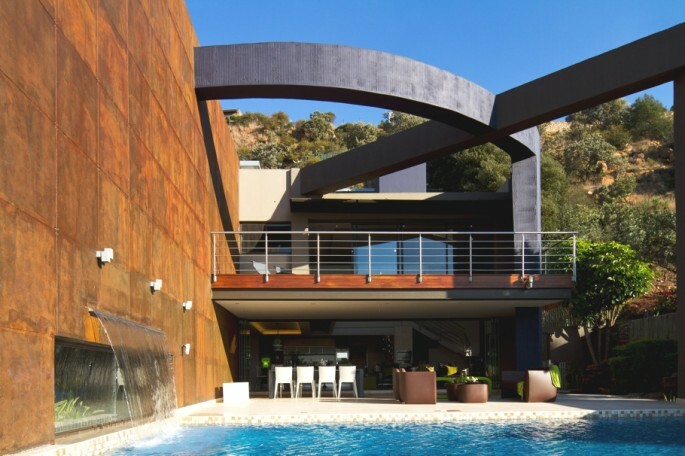 According to the architects: “They liked the current trend in our work towards a mix of steel construction and concrete framing. 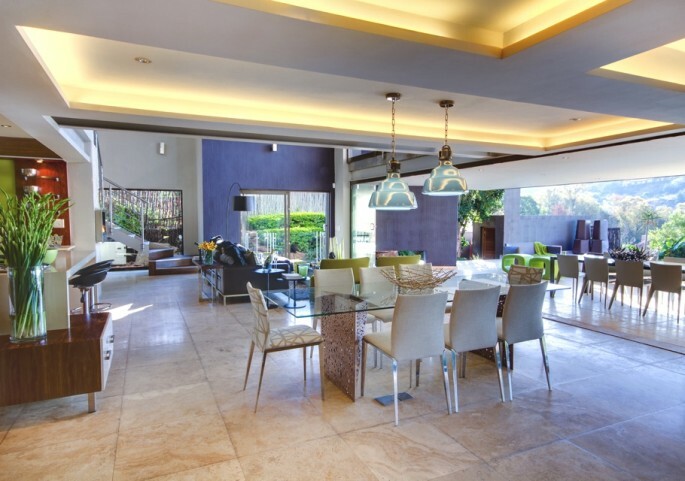 “The new design was achieved by removing most of the internal walls on the ground floor and adding a porte cochere and a new lanai with an infinity edge pool. 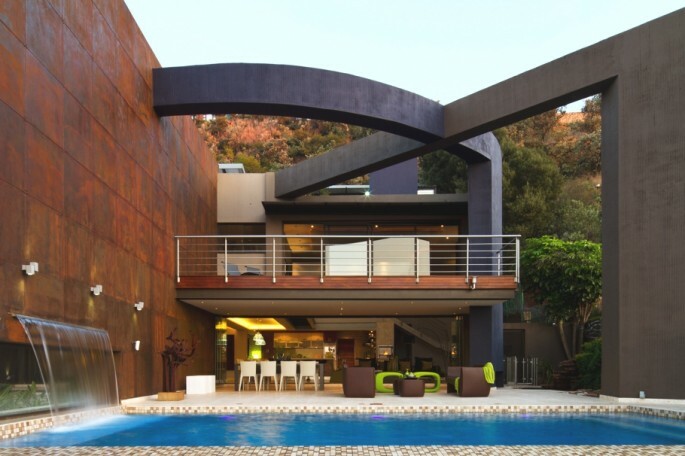 The impressive porte cochere is suspended from a semi-circular beam supported by the bisecting wall and a huge column and transfer beam over the pool. 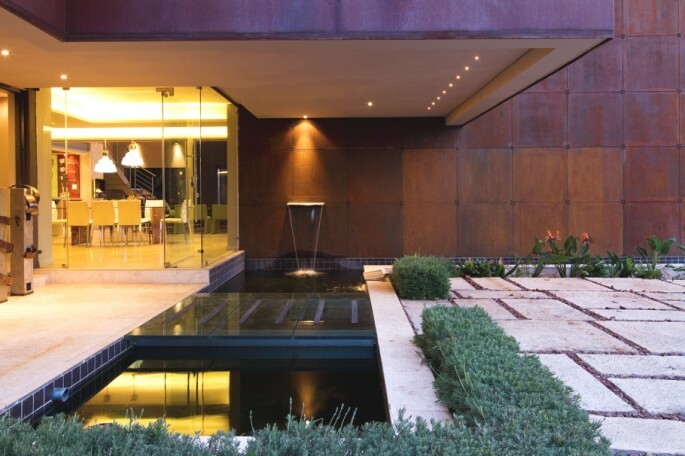 The element of water was added into the design with a koi pond to the north side of the existing lounge, with glass stepping stones that lead to a new pivoted glass front door. 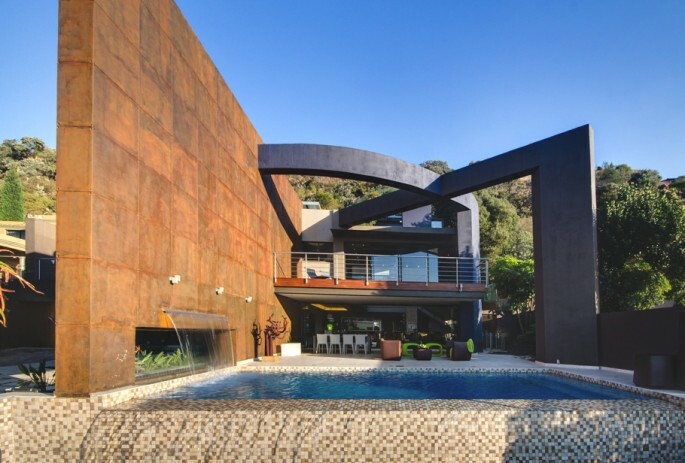 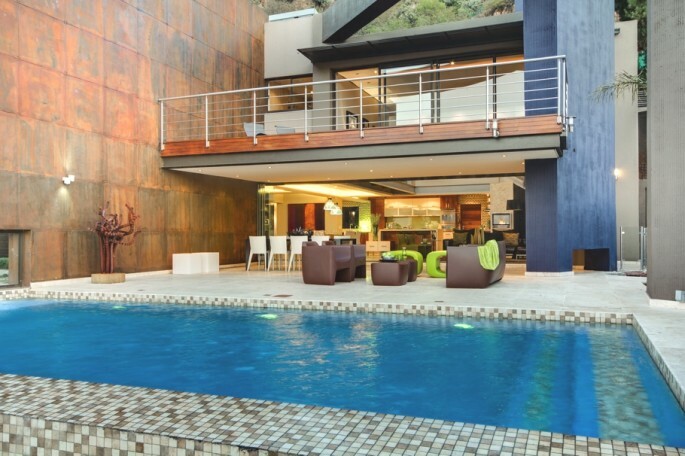 A small waterfall at the front door adds the welcoming sound of water, while a huge sheet of water is visible through a cut-out in the massive rusted steel wall bisecting the contemporary South African house to create a private pool area. 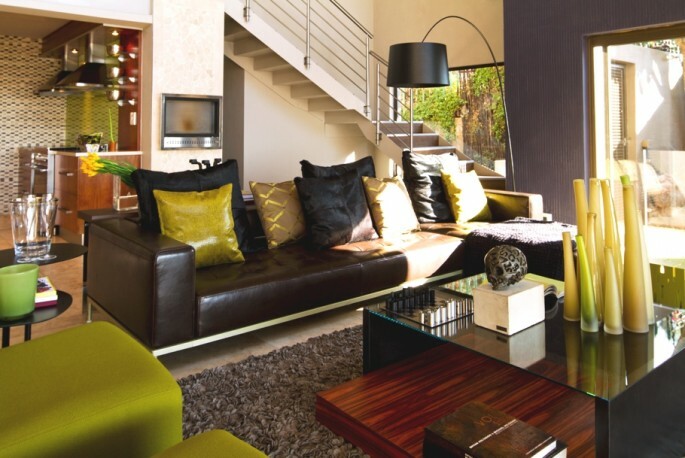 “M Square Lifestyle Necessities decorated the interiors using a palette of monochromatic colours with the interior furnishings in similar and contrasting colours. 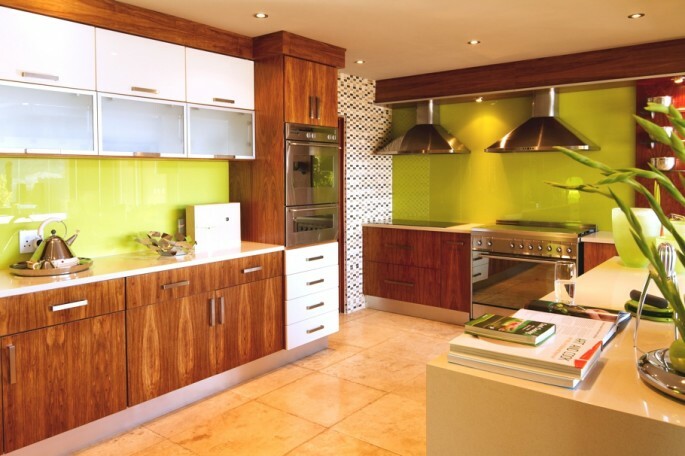 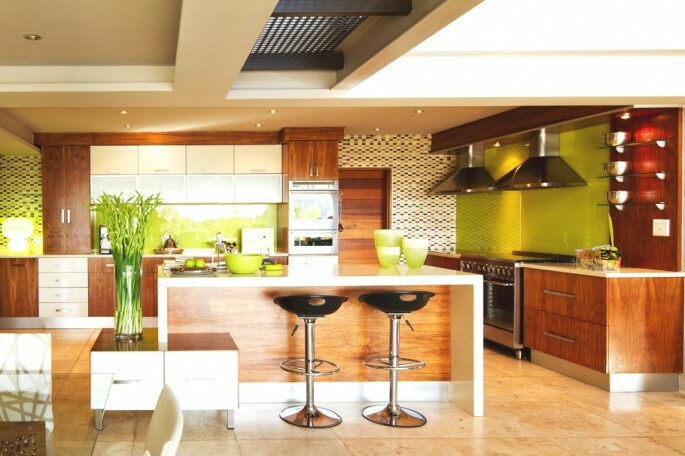 Accents of green were used sparingly to add fresh splashes of colour. 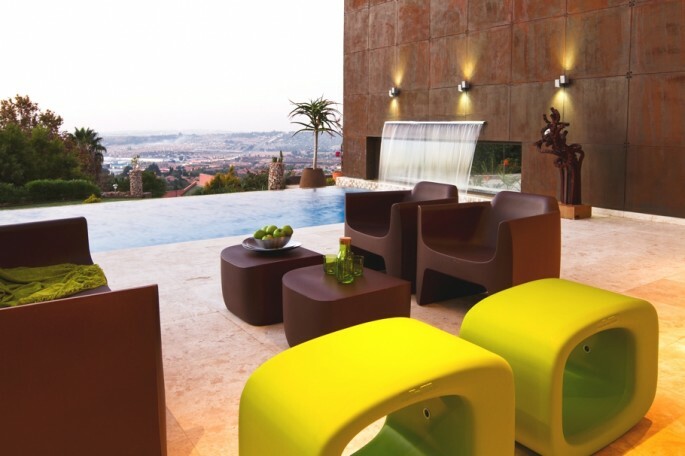 The modern lines of the furniture are a continuation of the interior structural lines. 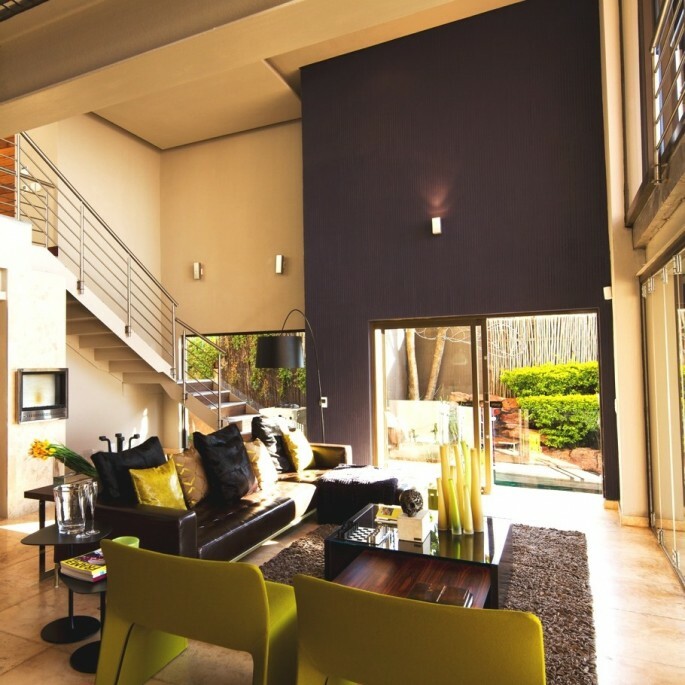 As the structural interior elements are simple with sharp lines, attention is brought to the furniture pieces and decorative items within the interior. 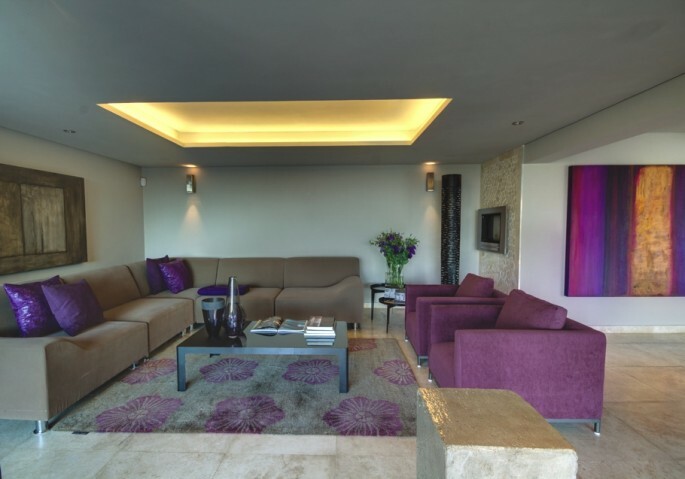 For this project, the interior designers professionally created these interior spaces with the use of its unique imported products, Molteni and C, Zeus and Ligne Pure. 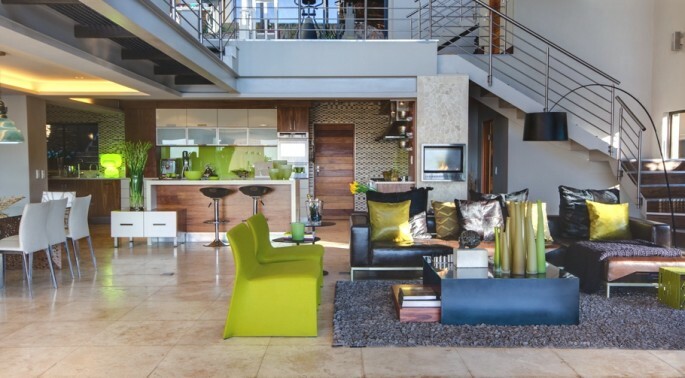 The designers cleverly balanced the stark simplicity of the structural elements with carefully selected and placed furniture pieces, colour schemes, soft furnishings and decorative details.